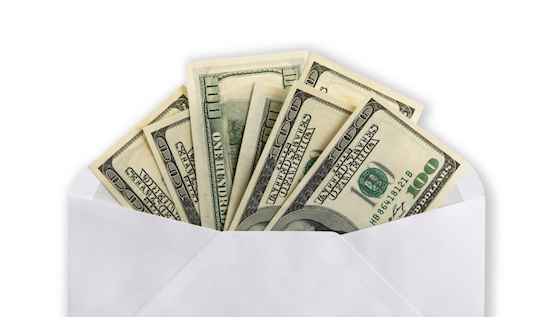 For years you’ve probably heard that you should never send cash in the mail. While there may have been some conventional wisdom to this old axiom, we’ve found that there are easy ways to get your cash where it needs to go with very little to no risk of theft. And it’s perfectly legal in the United States for small amounts of money. All you have to do is obey a few simple rules. You might be wondering why you would want to send money in the mail. There are numerous reasons and privacy is the primary one. When you send money by a wire service like Western Union, your information is not kept private. In addition, you incur a fee when sending money by wire transfer or by a related service. 1. Keep it discreet. Don’t send money in a flashy birthday card or package. Use a plain white or brown envelope that doesn’t attract attention. 2. Use 1st class mail (preferably USPS – or related service in your country). Despite it’s mediocre reputation, US mail is secure and protected by law. USPS 1st class mail simply requires a 1st class stamp you can purchase online or at any post office or grocery store. 3. Limit the number of currency bills you include. We recommend limiting the amount of cash included in an envelope to no more than 5 notes (that’s five of any denomination – singles, fives, tens, hundreds, etc.). You don’t want the envelope over stuffed, appearing like an envelope full of cash. It might be too tempting to someone along the chain of carriers. 4. Use the standard #10 envelope (or something similar). It measures approximately 4″ X 9.5″. If you can find the envelopes that are shaded or tinted on the inside then that is even better. Five bills fit nicely in the #10 envelope. 5. Use newspaper or sales ads to wrap your money in. This acts as a sort of camouflage for anyone trying to see what’s in the envelope. Essentially, you want any unwanted mail inspectors to think you are mailing something benign and not noteworthy like newspaper clippings or coupons. 6. Don’t take part in illegal activities. Our recommendations are for legal, above-board transactions. We don’t condone or promote illegal activity. 7. When possible, mail to and from secure locations – like postal boxes. Keep in mind that when you send mail to a residential mail box or other non-secure location, packages tend to sit unguarded for periods of time and have become easy targets for roving mail bandits.